Yesterday, US GDP figures beat expectations by climbing 2.5% against estimates for an increase of 2.2%. Signs that US economic growth is gaining momentum combined with a fall in the unemployment claims have reopened the case of less monetary stimulus. Although the exact timing of when the Fed will make its move is still anybody's guess, forex investors rushed into the dollar. As a result, the EUR/USD pair plunged 99 points to $1.3240. The volatile situation in Syria is likely to hold market attention in the short-term, with many waiting for the weapon inspectors' verdict. The geopolitical unrest has triggered a flight into the safety of the US dollar and this hit the shared currency. Global sentiment is turning risk averse and the spread trading markets seem to be discarding any positive economic data that comes out. As such, the EUR/USD pair dropped 52 points to $1.3339 despite figures which suggest that Germany is continuing to lead the Eurozone on the path to recovery. The euro managed to add 25 points against the dollar to $1.3392 yesterday, overcoming the risk off sentiment in the markets that usually sends investors into the US currency. Some better-than-expected economic data on the German business climate might have been supportive but going forward things could get tricky if events in the Middle East flare up. 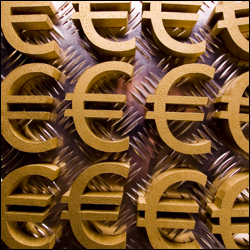 With the Eurozone economy showing ongoing signs of emerging from its record long recession, the shared currency also enjoined a nice rally versus the dollar. However, during the past few weeks, suggestions that the US is moving closer to stimulus reduction have started to make an impact, placing the EUR/USD pair on a path of consolidation. Therefore, yesterday's fall of a mere 15 points to $1.3369 is still in line with the short-term sideways movement.